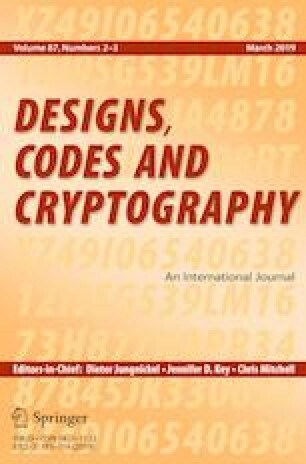 This volume contains 33 thoroughly refereed contributions concerning a wide range of topics in coding and cryptography. Almost all selected papers are the full journal versions of extended abstracts accepted for presentation at the International Workshop on Coding and Cryptography (WCC 2017) held in Saint Petersburg, Russia, September 18–22, 2017. The aim of WCC is to bring together researchers in all aspects of coding theory, cryptology and related areas, theoretical or applied. Each of the 75 extended abstracts originally submitted to the workshop were reviewed by at least two members of the Program Committee. As a result of the screening process, 48 papers were selected for the presentation at the workshop on Coding and Cryptography together with five invited talks, by Alexander Barg, Claude Carlet, Camilla Hollanti, Grigory A. Kabatiansky and Patrick R. J. Östergård. The papers presented at the workshop reflect the variety of themes involving both coding and cryptography, following the now well established tradition of the workshop. The authors of the presented papers were invited to submit full versions of their papers to the journal Designs, Codes and Cryptography. Each of the full-version submissions were once again thoroughly refereed by at least two anonymous reviewers. This volume is the end result of this full-fledged reviewing process. We are very grateful to all reviewers of these papers. We would like to thank all the authors and all the other participants of the WCC2017 for making it a highly stimulating meeting.